"Let's go work on some fighting techniques." meowed Peppermintnose as she touched noses with Bubblepaw. "Mind if we come with you?" meowed Raventhorn to Calmcloud. "Go get to know your new denmates." meowed Waveheart as he touched noses with Quickpaw. "Firepaw, Bubblepaw, Cardinalpaw, Havenpaw, Quickpaw!" cheered Crystalpaw for her new denmates. Firepaw padded into the BrookClan camp, carrying a squirrel in her jaws. She made her way into the elder's den, dropping the squirrel at the elder's paws with a dip of her head. Foxwater padded into the BrookClan camp, carrying cobwebs in her jaws. She made her way into the den she shared with Thunderpaw, placing the cobwebs into the storage. Mintflower pricked up his ears and padded over to hear what Wildstar had to say. "I, Wildstar, Leader of BrookClan, call upon my warrior ancestors to look down on this apprentice. He has trained hard to understand the ways of your noble code, and I commend him to you as a warrior in his turn. Eaglepaw, do you promise to uphold the warrior code and protect and defend this Clan, even at the cost of your life?" "Then by StarClan, I give you your warrior name. Eaglepaw, from this day on, you will be known as Eagleclaw. 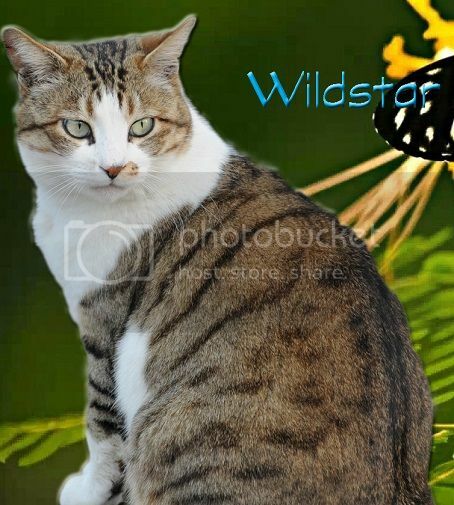 StarClan honors you and we welcome you as a full warrior of BrookClan." Padding forward, Wildstar rested her muzzle on top of Eagleclaw's head. Eagleclaw licked Wildstar's shoulder, then sat back and listened to the clan call out his new name. "Eagleclaw, Eagleclaw, Eagleclaw!" cheered Bubblepaw for her former denmate. Havenpaw pulled a minnow from the fresh-kill pile and sat down nearby to eat. Tornadotail padded past her clanmates and into the nursery, squeezing inside carefully. Once inside, she scratched together a nest and settled down into it. Cometberry pricked up her ears and padded over to hear what Wildstar had to say. "I, Wildstar, Leader of BrookClan, call upon my warrior ancestors to look down on these apprentices. They have trained hard to understand the ways of your noble code, and I commend them to you as warriors in their turn. Crystalpaw, Riverpaw, do you promise to uphold the warrior code and protect and defend this Clan, even at the cost of your life?" "Then by StarClan, I give you both your warrior names." continued Wildstar. "Crystalpaw, from this day on, you will be known as Crystalbriar. Riverpaw, from this day on, you will be known as Riverpelt. StarClan honors you both and we welcome you as full warriors of BrookClan." Crystalbriar puffed out her chest as she listened to the clan call out their new names. Riverpelt purred loudly as the clan called out their new names. "Crystalbriar, Riverpelt! Crystalbriar, Riverpelt!" cheered Blazenest for his new denmates. Foxwater padded into the BrookClan camp, carrying tansy in her jaws. She made her way into the den she shared with Thunderpaw, placing the tansy into the storage.